The line and circles extend outward from the storm cell and predict where the storm could be in 20, 40, and 60 minutes. The current position of the cell is the circle next to the number (the “echo top”, or height of the storm cell). 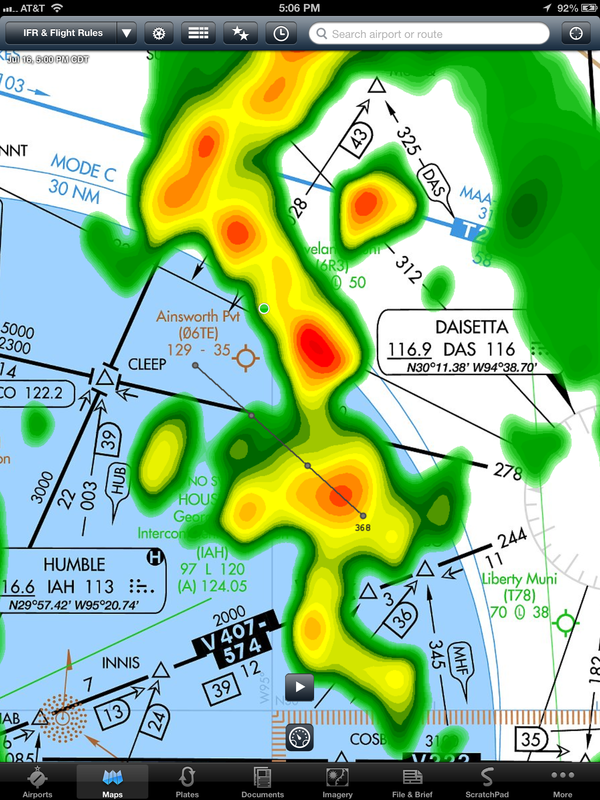 In the picture above, the storm cell is registering a top at FL368 and moving to the northwest. It is predicted to be near Ainsworth airport in one hour. So, to read the track, find the dot next to the echo top value and follow the track out from there and you’ll have a good sense of where the storm is heading. If a storm is registering a number of echo tops, only one track is showing to de-clutter the display. The algorithm for selecting the cell locates the highest top within a defined radius, and filters the remainder out until a reasonable number of tracks are displayed. If all cells were to be drawn with its predicted track shown, the display would get quite busy. So, the algorithm finds the best track to display and shows it.